ISTANBUL: Turkey’s military killed 11 Kurdish militants in its southern Hatay province bordering Syria overnight, the governor’s office said on Tuesday, and the army said two of its soldiers were killed in a blast in Syria’s Afrin region. Backed by air support, Turkish security forces opened fire and killed the militants after spotting them in Hatay’s Arsuz district, near the Mediterranean Sea, the governor’s office said in a statement. It said the military seized the bodies of six of militants, along with M-16 rifles, a rocket launcher and ammunition. The group was believed to be behind several attacks in the province last year, it said. Turkey has fought an insurgency with Kurdistan Workers Party (PKK) militants since 1984 and more than 40,000 people have been killed in the fighting, which is largely focused in Turkey’s southeast, hundreds of kilometers east of Hatay. In January, Turkey’s army and its Syrian rebel allies began a military offensive against the Kurdish YPG militia in Syria’s Afrin, bordering Hatay, and gained full control of the region at the weekend, according to a military source. 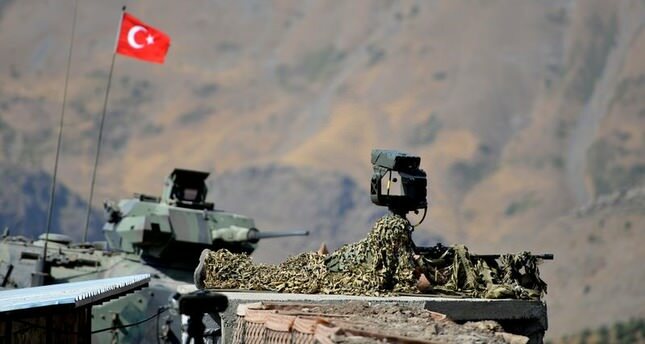 Separately, the Turkish Armed Forces said two Turkish soldiers died as a result of an improvised explosive device blast during search operations in Afrin region on Monday. Turkey regards the YPG as terrorists and an extension of the outlawed PKK. The European Union and United States designate the PKK a terrorist group but the YPG is a U.S. partner in the fight against Islamic State jihadists in Syria.